Recently, my AirPort network hit a major snag. 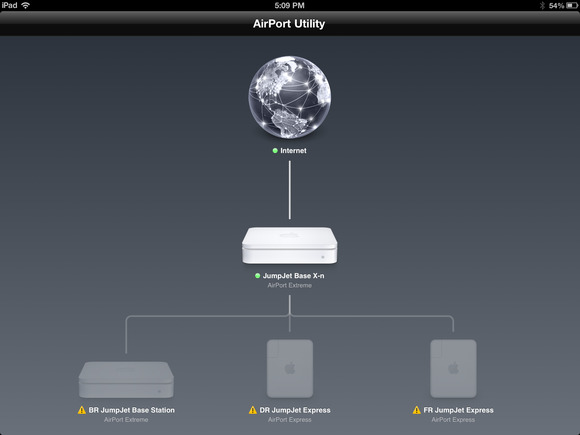 While my main Base Station continued to function properly, AirPort Utility (on my Mac and iPad) indicated that my three subsidiary AirPort devices had dropped off the network (see image above). Selecting any of the devices in the bottom row resulted in a “Device not found” error. Confirming that these AirPort devices were indeed MIA, none of my wireless devices (iPhone, iPad, MacBook Pro) would connect to them. The situation with AirPort Utility on my iPhone was even more disturbing: no AirPort devices showed up at all! Huh? Everything had been working fine for months. I had made no changes to the AirPort hardware or settings. Why this sudden and unexpected collapse? One possibility focused on AirPort Utility itself. I had recently updated the application to version 6.3, the version needed to accommodate the new Base Stations with 802.11ac support. 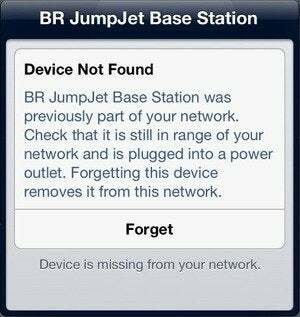 However, a software bug seemed more likely to precipitate only a communication failure between AirPort Utility and the AirPort devices, rather than an actual removal of the devices from the network. This message pops up if I select one of the problem devices. In any case, a search of the web revealed numerous confirmations of networking problems first appearing after updating to AirPort Utility 6.3. The initial posting of one thread sounded exactly like an instance of my “Device not found” error. More generally, reported problems centered on various failures of AirPort Utility to access AirPort Base Stations. 1. Go to Network System Preferences on your Mac. 2. Select your active network service (e.g., Wi-Fi or Ethernet) and click the Advanced button. 3. Click the TCP/IP tab. 4. Choose the “Link-local only” option from the Configure IPv6 pop-up menu and click OK.
To fix similar problems with AirPort Utility on iOS devices, Apple’s advice is simpler: Just power down the device and turn it back on. Unfortunately, I discovered all of this only after I had already made my own attempts to fix the problem. I wound up resetting all four of my AirPort devices and re-entering all their settings. This made for a long and frustrating evening, but eventually I got the entire network working again. As it turned out, my fix did not require any change to the Configure IPv6 setting; it remains set to “Automatically.” This was not a big surprise, as I suspect my problem went beyond what the IPv6 setting addresses. For my iPhone, Apple’s recommendation to power down the device was what was needed to get its AirPort Utility back on track. After a restart, all my devices were again listed on the phone. If you are experiencing AirPort problems similar to what I’ve described here, take heart. Your hardware almost certainly does not need any repair or replacement. Based on what I’ve read online and my own experience, at least one of the suggested fixes should remedy your situation.